Since 1989, River Hills Golf and Country Club has been a favorite Myrtle Beach golf course for both locals and tourists alike. Located on Hwy. 17 in the historic seaside community of Little River, South Carolina, River Hills make it a wonderful golf course to include in your Myrtle Beach Golf Authority golf package. Golf course architect Tom Jackson laid out a challenging but fun course with River Hills. 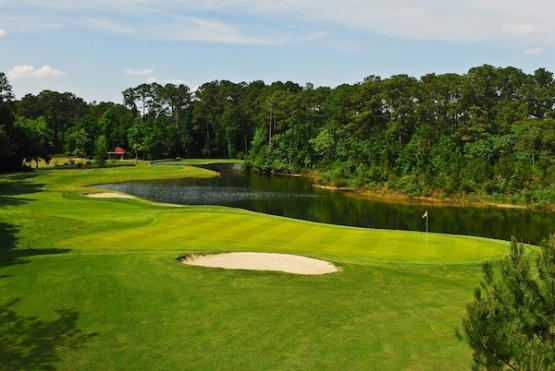 River Hills offers up to forty foot elevation changes, which is unique to Myrtle Beach golf. The golf course is heavily wooded with beautiful fairways that wind through strategically placed bunkers and water hazards. The natural setting is home to an abundance of wildlife that include a wide array of birds, fox squirrels, raccoons, possums, alligators and an occasional bobcat. This traditional golf course offers itself for some unique Myrtle Beach golf photo opportunities as well as a challenge for all skill levels of golfers. The 14th and 17th holes are both considered to be two of the best holes on the Grand Strand. When searching for the best in Myrtle Beach golf deals you should consider a Myrtle Beach Golf Authority golf package. Myrtle Beach Golf Authority has the very best in Myrtle Beach accommodations with its wide variety of North Myrtle Beach condos, hotels and beautiful ocean front beach houses. The mild Myrtle Beach weather, beautiful golf courses, sandy beaches and world-class Myrtle Beach entertainment are waiting for you to book your Myrtle Beach golf package today! Beautiful course. Got a late start due to weather but stillgot our game in. Professional and friendly staff. Went home covered in mud splatters but had a great day. Will definitely play again next time we're down there.